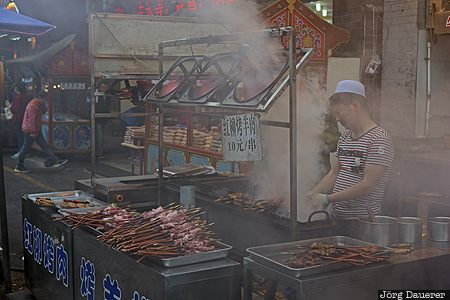 A street vendor grilling meat skewers surrounded by smoke seen in the Muslim Quarter of old Xi'an. Xi'an is in Shaanxi Province in the east of China. This photo was taken at noon on a cloudy day in April of 2015. This photo was taken with a digital camera.